Is the City of London Police ‘Terrorism/Extremism update for the Business Community’ pictured above genuine or some sort of unsubtle hoax? After coming across the picture – courtesy of @HeardinLondon – I, like many others, became intrigued. 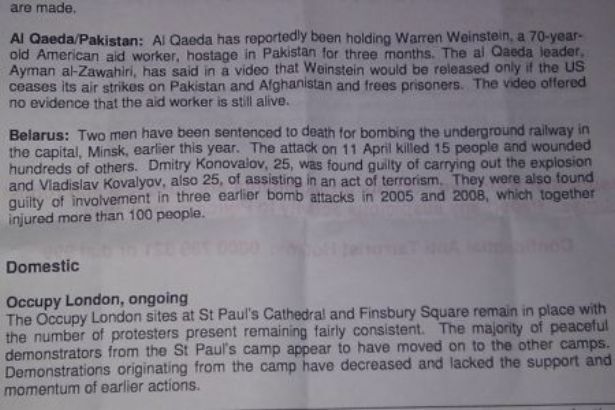 Indeed, half way down the page, after solemn updates on terrorist incidents in ‘Colombia’, ‘Pakistan/Al-Qaeda’ and ‘Belarus’, we find a curious segment on … the ‘Occupy London Stock Exchange’ movement (OccupyLSX). This contained even more curious mentions of people who “fit the anti-capitalist profile” and are alleged to be undertaking “hostile reconnaissance”. Most of those tweeting about this were uncertain as to the document’s authenticity. I decided to give up trying to guess and, instead, filed a Freedom of Information Act request asking City Police to confirm whether the communiqué was genuine and, if so, to provide copies of all communiqués issued by it that mentioned OccupyLSX. For good measure, I asked City Police to confirm whether it considered OccupyLSX to be a domestic extremist group. With the start of the New Year came the much awaited response. Despite the rigmarole of FOI and its somewhat weak make-up, it delivered results on this occasion. It turned out the document was genuine. As an afterthought, I immediately called back and asked: how many communiqués have been issued from the day OccupyLSX started until Jan 4th? A total of nine, answered the helpful officer. Out of those, seven mentioned OccupyLSX. Accompanying OccupyLSX in this ‘Terrorism/Extremism’ rogues’ gallery is a series of other peaceful protest groups and organisations: a list that includes “UKUNCUT”, “Climate Justice Collective” and, most dangerous of all, a “Mass healing ritual performed as a silent march”. In other words, a regular “Terrorism/Extremism” business community update disseminated by City Police has, on seven separate occasions, not only slandered a group of peaceful protestors camping in freezing weather against corporate greed, but smeared them as somehow being connected to proscribed and violent organisations such as the Revolutionary Armed Forces of Colombia (FARC) and Al-Qai’da. Unsurprisingly, the City of London Police now state that they do “not regard the LSX Occupy movement as a domestic extremist group”. Indeed, when the story was initially broken by The Independent in early December, a “police source” insisted that although the wording of the communiqué was poor its intention was never to suggest that OccupyLSX demonstrators posed “a terrorist threat”. The source’s remarks clearly intended to suggest this was simply a case of an honest mistake. One could be tempted to take this explanation at face value. After all, Police forces and large governmental organisations are run by human beings, and all human beings make mistakes. However, what could be presented as incompetence or an error in good faith the first or second time starts to look suspiciously like deliberate sabotage after six or seven repeats. As my personal experiences have taught me over the last three years, and my research is teaching me at present, a lot of these so-called ‘mistakes’ are widespread not because of inadvertence or carelessness, but because British security bodies and the police, are systemically ultra-suspicious of anyone seen as out of step with the establishment and big business. As such, rather than highlighting an aberration, this latest episode fits an observed, well-known pattern. Of course, whether the (City of London) police genuinely believe OccupyLSX are domestic extremists or not is a debatable matter; a debate that needs to be had. As yesterday’s Independent, reporting on my findings, pointed out, the Police have a case to answer over their approach to protest groups. But before that, two things must happen. Firstly, City of London Police need to issue a full and unconditional apology to OccupyLSX and all other peaceful organisations included in communiqués featuring violent groups. OccupyLSX are not domestic extremists or terrorists, so City Police should have no problem understanding why they, and their supporters (including myself), are deeply offended by their repeated attempts to insinuate such sinister connections. Secondly, the body responsible for coordinating the policing response to counter-terrorism and domestic extremism in England, Wales and Northern Ireland is SO-15, or ‘Counter-Terrorism Command’ (CTC), situated in New Scotland Yard. This organisation should provide an official confirmation regarding the risk (i.e. lack of) posed to either national security or public order not only by OccupyLSX but also groups such as UKUNCUT. Once these clarifications have been offered, and a little transparency given, an open, frank debate can take place about how the British State has been maltreating peaceful campaigners and activists, many of whom selfless individuals trying, as best they can, to make this country, and the wider world, a fairer, more equal place. Unless this is done, “mistakes” will continue to be made, and innocent individuals and communities will continue to pay the price for them. The FOI request and the original disclosure can be viewed by clicking here. Rizwaan Sabir is a final year PhD student at the University of Bath and a commentator on British counter-terrorism, human rights and policing. He writes for, amongst others, the Guardian, Al-Jazeera and Ceasefire. He can be reached via email or Twitter @RizwaanSabir. Great article, Riz. This is very much part of a larger pattern, as you say. The police involve themselves in political enforcement, instead of law enforcement. Political patronage through the honours system is much to blame for this. Keep up the good work. There are a lot of us looking on with amazement, gratitude and appreciation. Well done Rizwaan, these results show that it certainly is worthwhile pursuing the absurdities the police continually emit with such little regard for what they’re actually saying. Keep putting in those FOI’s until we have freedom! Well done, Rizwaan. Good work. It is truly disturbing to observe – as Robin Gitte points out, above – that the police are so heavily involved in political enforcement, instead of law enforcement. That this goes largely unquestioned by mainstream media commentators is an indicator of how deeply into the mire, democracy has already descended. Keep up the good work. “OccupyLSX are not domestic extremists or terrorists”. I agree they are not terrorists, however, on one definition of ‘extremist’, namely, one who applies to the foreign policy of our government the same standards it applies to our official enemies, I myself am proud to be an extremist, and I think OccupyLSX should do the same. Thus, to suggest that the invasion and occupation of foreign countries without UN authorisation is criminal and immoral, rather than just a mistake, is evidently to be an extremist. Fine! What I resent, however, is the modifier ‘domestic’. I wash a few dishes the same as anybody else and throw back my duvet in the morning. What’s wrong with that? That’s where the apology is required. Thank you all for your comments and words of support. It’s good to have feedback. Stephen, i wrote to the City of London police and asked for a general statement of apology, but i do think that you make an important point that the people involved in OccupyLSX are just that: people, and therefore shouldn’t be treated like they are criminals. It’s a powerful point. Why don’t you write to the Commissioner of the City of London Police? A letter that i sent is here in template format. Maybe you could tweak it and let him know why it’s important? It’s all part of a collective effort that keeps up the pressure, i believe.